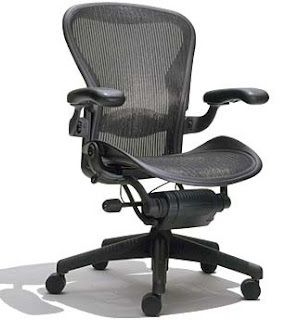 Ergonomic Task Chairs. Because this has the potential of being a very lengthy post I will be posting it over two days. "Liberty, with Form-Sensing Mesh Technology, is unlike any mesh chair you’ve seen or experienced. With its tri-panel construction, it has the body-fitting contours that single-panel stretch mesh chairs simply can’t achieve. 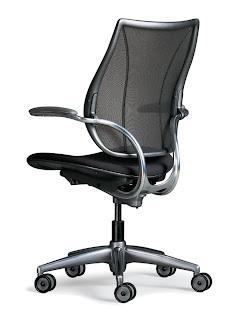 And it offers perfect lumbar support for everyone, without external devices or manual adjustments. Liberty’s mesh back is formed by combining three panels of non-stretch mesh in the same way a tailor combines multiple pieces of material to form a shirt. Its contours are custom-made to both fit and support the human body in unprecedented comfort." The mesh back is cool and comfortable and molds effortlessly to your back as you move and shift around during your work. It's padded arm rests are easy to adjust and tilt as there is an easy to locate button underneath the arms. It's only lever is for the height as the rest of the adjustments it seems to do itself. "The Aeron chair didn't end up in the Museum of Modern Art's permanent collection just because it looks cool. Although it does. Its looks are only the beginning. 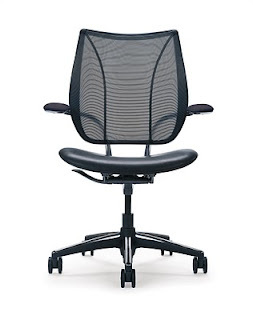 Aeron accommodates both the sitter and the environment. It adapts naturally to virtually every body, and it's 94% recyclable. Even if it's black, it's green ." My favourite feature of this chair is the rocking/tilting action in the seat which is extremely comfortable. 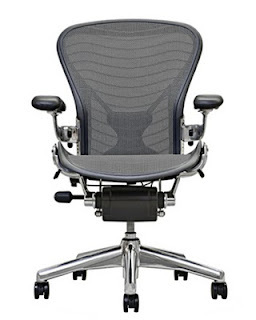 Although there is a lever to adjust how much if any rocking you want to prevent you from slouching. It has an adjustable back support where you can put exactly where you need it.